Welcome to the Creditor's section of the Court's website. Here you will find information relevant to you and your business with the Court. You are a creditor in a bankruptcy case if the debtor (the person or entity that filed for bankruptcy) owes you money or if you claim to be owed money by the debtor. If you have received a notice from the court about a particular bankruptcy case, it means that the debtor has listed you in the debtor's bankruptcy case as someone to whom the debtor owes money or might owe money. A proof of claim can be conveniently filed electronically in all bankruptcy cases. Filing electronically requires access to the internet, but no login or password is necessary. Creditors should redact all private identifiers from any document submitted to the court. Creditors who file 10 or more claims in the Western District of Washington in any 6 month period are required to file their claims electronically. See General Order 2013-4. Institutional creditors who will be filing documents other than claims and claims supplements may consider a limited use account for filing documents in the court's Case Management/Electronic Case Filing system. Creditors who have filed a proof of claim in a particular case are automatically added to the mailing matrix and will receive notice by mail as required by national and local bankruptcy rules. The National Creditor Registration Service and Electronic Bankruptcy Noticing (EBN) will simplify the noticing process, particularly for larger institutional creditors. 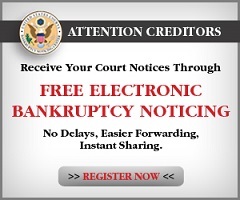 Creditors may establish a PACER account to electronically review the activity in any case. Standard PACER charges apply, however fees are waived for users who incur less than $15 of use in a quarterly billing cycle. Electronic case dockets can be viewed in the public lobby of the clerk's office during regular business hours. NOTE: Creditors and others with limited use electronic filing accounts do not have access to the Court's Courtesy Notice event, Request for Special Notice, or Notice of Appearance events. Morel information about the bankruptcy process and the different bankruptcy chapters is avialbale under the Filing Without an Attorney tab pf this website. If you believe that a debtor is being untruthful in a bankruptcy case in this district, call or write the United States Trustee's Office at (206) 553-2000. You can also send an email to the U.S. Trustee's Fraud Hotline at USTP.Bankruptcy.Fraud@usdoj.gov. For more information, visit the U.S. Trustee's website.